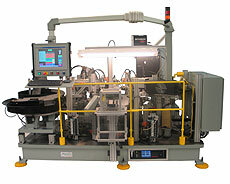 Automated laser marking systems are used for marking plastic or metal materials. Laser marking is also called laser engraving. Automated laser marking systems can mark characters/letters, bar codes, 2D bar code or most anything you can imagine. These markings are often used for parts identification, parts labeling, traceability, etc. Dial-X Automated Equipment, Inc. has the experience and flexibility to meet your exact laser marking system needs. For further information or a free quote on automated laser marking systems, contact Dial-X Automated Equipment, Inc.